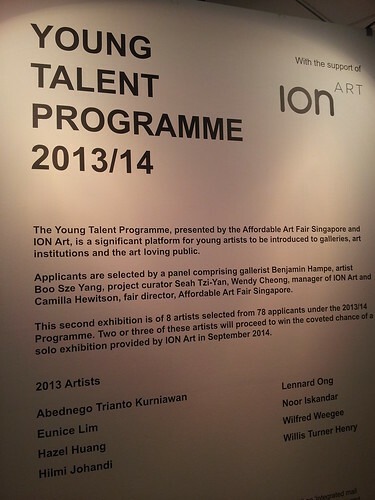 Affordable Art Fair 2013 saw eight emerging artists display their works as part of the Young Talent Programme 2013, in collaboration with ION Art and curated by Seah Tzi Yan, director of T.H.E.O. Arts Professionals PL. 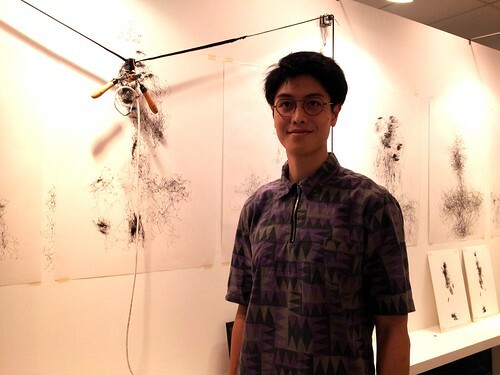 ARTITUTE highlights four young artists whose works found much-needed exposure at the fourth edition of the London-based art fair – its biggest edition in Singapore yet, with close to 18,000 visitors and a sales figure totalling $4.9 million in three days. 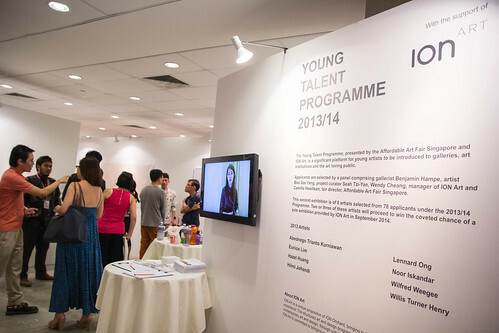 Eunice Lim, one of the young artists featured, thinks that aspiring artists should not limit themselves within the confines of art school and try to gain early exposure in the industry. 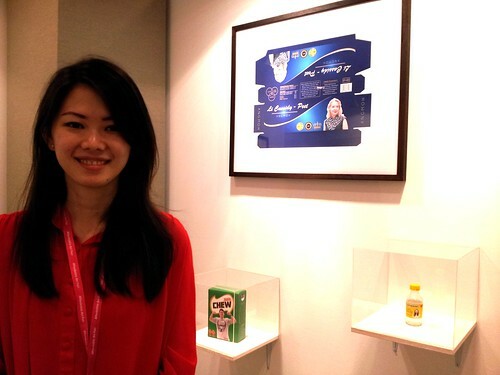 Articulate and personable in real life, the 22-year-old Lasalle College of the Arts student expresses on her website her keenness to explore through art “the omnipresence of narrative in culture” and “how people are influenced by mass cultures”. With such a contemporary impulse in her work and in exploring the commonplace theme of fairytales (Fairytales for Twenty-Somethings, anyone?) by experimenting with changing mediums, it is little wonder that her collage composition The Neverland News (2012) was immediately snapped up on the first day of the art fair. The Neverland News consists of several pages of collages that express the dominance of the internet in our lived culture. These collages feature themes from the J.M. Barrie’s Peter Pan, cute teddy bears, Lego figures and video game consoles, and recognizable Internet brands like Google, Youtube and Facebook, all of which seem to comment on how the current digital space and the globalized culture influence the way young people craft their identities online, perhaps to the point of being infantilized or causing prolonged adolescence among them. 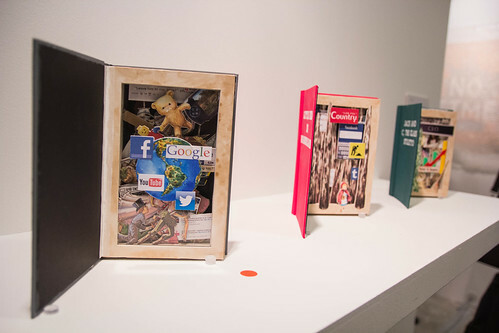 The artist bounds these collages as if like a book, which represents a traditional and tactile medium, in an attempt to “contain” the vast, elusive virtuality of contemporary lived culture that plays itself out in “the neverland” of the digital space. At the same time, the work points to how certain narratives like Peter Pan and fairytales continue to resonate among us regardless of changing mediums and new formats. Two other works accompany The Neverland News in her “Transparent Correlation Series” (2012): Little Red in Wanderland and Jack and C, The Glass Stiletto. The former illustrates how young women are now expected to find themselves in the wilderness only to end up isolated and lost, while Jack and C, the Glass Stiletto shows the beanstalk as the “Route to Rewards” (with the CEO position at the top) and how this route is idealised for young men, and in turn, these men are idealised by modern-day Cinderellas who desire to marry up to change their fortunes and influenced by the formulaic narratives found in most Korean dramas. The childlike imagery present in these works belies the uneasy realities reflected by contemporary society in the same way fairytales have evolved to obscure the unsavoury origins of their narratives. If Eunice tries to contain digital lived culture using the traditional medium of the book and illustrate how gender expectations are reinforced in spite of the unprecedented freedoms in contemporary times, NTU Art, Design and Media final-year student Noor Iskandar explores gender and traditional tensions through photography and the hijab in his triptych work, I Will Only Let the Wind Hit My Face (2012). The artist postulates how Muslim women are made simultaneously visible and invisible through the hijab, as society singles them out based on what they choose to wear rather than who they are. Through this work, he attempts to illustrate that the hijab need not be constraining for the women who wear them, nor should society ascribe constraining stereotypes on them for choosing to wear it as a marker of their identity. Noor Iskandar strives to express movement in stillness and potential mobility despite being sheltered by the hijab. This is particularly evident in the centre photograph where a hijab­-covered figure holds a motorcycle helmet: with a mise-en-scene depicting a delicate floral-like figure holding a decapitated head, the work reveals how her defiance of society’s expectations may be deemed improper and profane. In using photography as a mode of representation but making the photographs look as if they were paintings – that is, harking back to a more traditional medium – Noor Iskandar manages to offer a possibility for tradition to be both transcended and preserved. I Will Only Let the Wind Hit My Face is a subtle step to infuse serious feminist and religious discourse using experimental medium, which the young artist should continue to explore more meaningfully in his future endeavours. 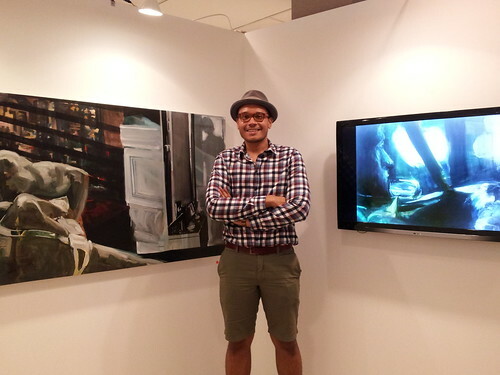 Indonesian artist Abednego Trianto grounds his modern-day practice of photography in archival research and historicity. 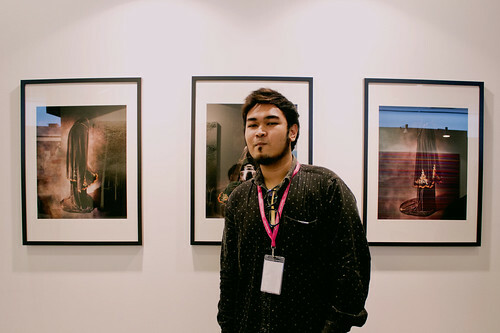 Abednego graduated from NTU’s School of Art, Design and Media in 2010 and was the first recipient of Kwek Leng Joo Prize of Excellence in Still Photography. 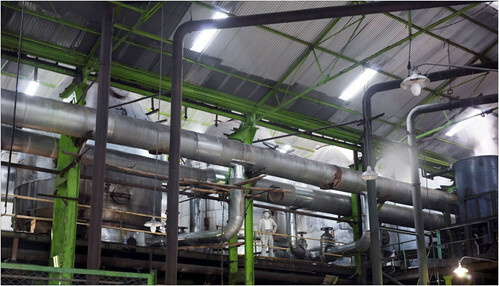 He recently worked on a series called “Sugar Lord Java”, which questioned the romanticising aspect of colonial photography in the sugar industry in the Dutch East Indies (now Indonesia). 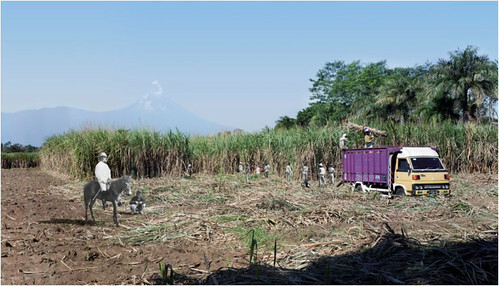 In Sugar Cane Harvesting at the Base of Mount Semeru, Abednego took multiple identical photographs of the sugar fields before painstakingly re-constructing the picture by piecing together smaller parts and including cut-out images from colonial photographs. This technique culminated in a composition that portrays a seamless patchwork of the past and the present. This is Abednego’s attempt to “reconcile colonial and contemporary viewpoints” after he encountered the striking contradiction between what he learned in history through formal schooling in Indonesia (“written by the winners”, he said) and his later reading of works by writers such as Pramoedya Ananta Toer, Edward Douwes Dekker’s Multatuli and Liem Tjwan Ling’s Raja Gula Oei Tiong Ham. 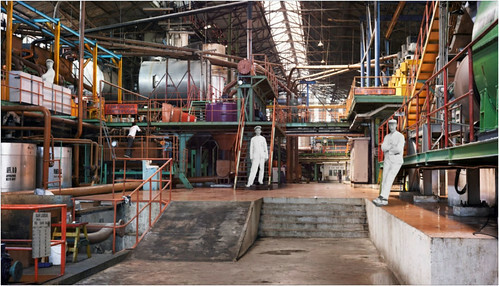 Using photography and editing software, the artist reveals the necessarily incomplete nature of knowledge found in the archives that renders historical understanding pliable to contemporary reconstructions and revisions. In Rampok Macan, Abednego combines two different archival photographs and flipped one of them to complete the field that set the stage for the traditional Javanese ceremony called “rampok macan” (tiger fight), which plays out an archetypal battle of good-versus-evil featuring a tiger (symbolising evil, power and disaster) and a buffalo (symbolising the land, good spirit and hard work). 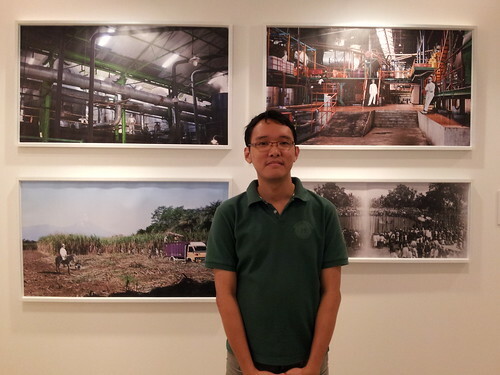 His works explore colonial power relations through the juxtaposition of Dutch-owned sugar factories and Peranakan Chinese-owned ones, where he found distinct differences in architecture and management styles based on his research. Abednego also highlights the rise of Oei Tiong Ham as one of the prominent Peranakan Chinese in Indonesia during colonial times and whose influence in trade extended to Singapore. For him, the legacy of colonialism is meant “to be reconciled, not ended” and “needs to be studied thoroughly using multiple points of views”. 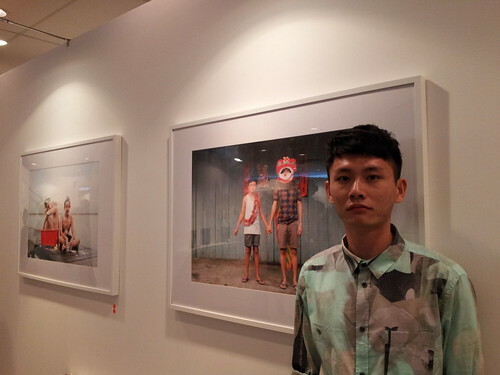 Other works by Abednego Trianto featured at the Affordable Art Fair. Fellow Indonesian artist Willis Turner Henry transposes the colonial power relations explored in Abednego’s artworks onto today’s globalised society. Perhaps because of the continuities and parallels of the themes explored by both Indonesian artists, their works were also concurrently featured in re:union at Gallery 2902, a recent exhibition curated by Jane Koh. Willis’s “New Native” series contain artworks based on her study of themes of identity, sense of belonging and the effects of migration. 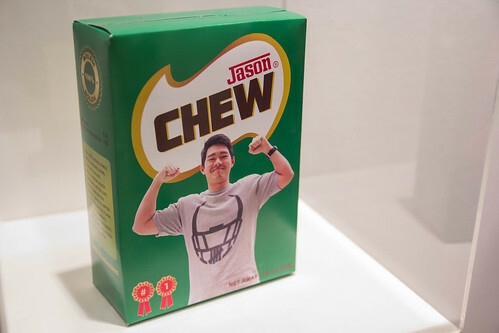 The Medan-born artist focuses on the growth of Diasporas vis-a-vis the context of Singapore as a country that in recent years saw a significant spike in its foreign-born population. As “new natives”, these foreigners are playfully portrayed as “products of society” and likened to commodities with little control of how they are “branded” or of the values attributed to them by society. 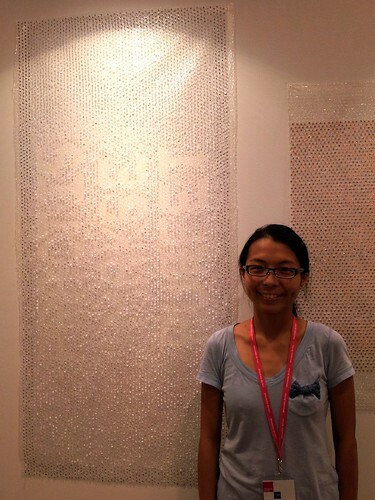 Riya de los Reyes is a freelance writer on contemporary Asian art and culture. She currently works at a publishing house and was an alumni of the Curating Lab Programme (2012).